After a rare poor performance at the United Center on Friday night, Blackhawks coach Joel Quenneville was clear that some things needed to change. 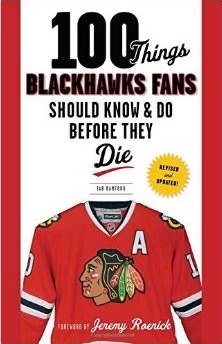 The apathy needed to die, or the season’s longest losing streak wouldn’t. On Saturday night, the effort was night-and-day different from Friday’s weak performance. Antti Niemi returned from the flu with a spectacular performance, and the physical play that was glaringly missing on Friday was clearly present in St. Louis. The start of the changes came from Quenneville, who made some fairly dramatic changes to the lines. 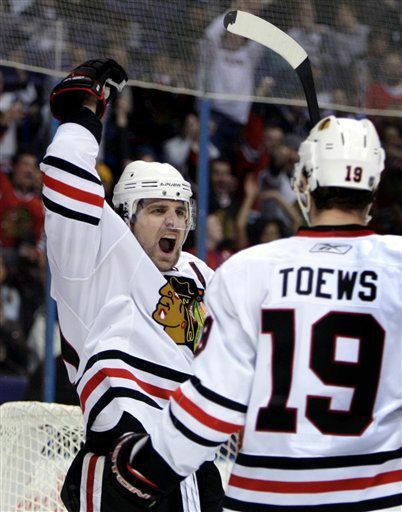 He put Patrick Sharp back with Jonathan Toews and Patrick Kane, with whom he skated for most of last year. He also bumped Tomas Kopecky up to the second line with Dave Bolland and Marian Hossa. Troy Brouwer shifted down to the third line with John Madden and Dustin Byfuglien, and Andrew Ladd moved down to the fourth line with Kris Versteeg and Colin Fraser. Lots of changes, but clearly they worked. Toews placed himself at the forefront of the accountability list, as any good captain should, and he responded with an incredibly strong first period. He pushed a rebound back in front of the net where Sharp was able to score the first goal of the night early in the first period, and then received a gorgeous pass from Kane to score the second goal. 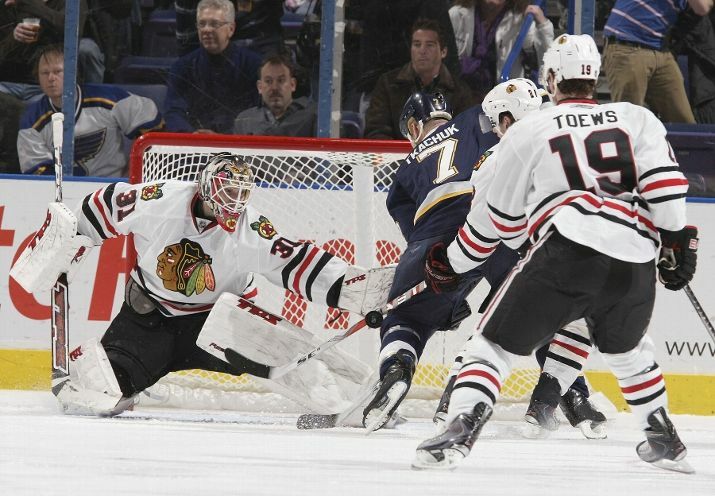 In the first, Toews had two points, was (obviously) +2, and won six of his seven faceoffs. Niemi received a significantly better effort from the defensemen in front of him on Saturday than Huet had in at least the last two, if not four, games. Niklas Hjalmarsson and Brent Seabrook were especially impressive, blocking shots at key times throughout the game and both taking, and giving, big hits all night. Seabrook was credited with three blocks and Hjalmarsson was credited with only two, and neither number feels adequate for the work the two did against the Blues. Seabrook was credited with five hits to lead a physical attack from the Hawks as well. The story of the game has to center around the Number One Star: Niemi. Having not played since being removed after one period in Vancouver two weeks ago and then missing his last start because of the flu, Niemi returned in magnificent fashion to earn a very important victory for the Hawks. He stopped 34 of 35 shots, and the one goal he did allow was during a six-on-three rush with under two minutes left in the game. He did get a little help from the zebras, though, as a quick whistle took a goal away from the Blues early in the second period. That doesn’t take away from a stellar performance that will undoubtedly re-open the controversy between the pipes in Chicago. Coming into Saturday night’s game, and including the three-goal, one-period performance in Vancouver, Niemi’s road numbers were ridiculous: 7-2-1 with a .943 save percentage and a 1.53 goals against average. The Blackhawks PK was tested a lot on Saturday night, and was thankfully up to the task. The Hawks had to kill eight penalties in the game, and were up to the task until the final two minutes when St. Louis pulled Chris Mason out of the net to have a three-skater advantage. Even then, the Hawks did a good job of keeping active sticks in the passing lanes and clearing any rebounds Niemi left on the ice, but couldn’t keep the puck out of the net for any longer. The power play offense for the Hawks remains a point of frustration, as the unit was unable to score in five chances on Saturday night. The effort was clearly better on the road than the home fans received just a day before, though, and the Hawks held their early lead though the final horn to get back into the win column. I agree. And I doubt it’ll be much longer before that move comes, too. I believe nothing will happen until after the Olympic break. But I do agree that a trade will happen before the deadline. Biggest question is our goalie. Huet, while being very inconsistent, is also pretty expensive. Do we really think he can give us 16 wins this postseason, is he mentally tough enough? If Niemi can finally answer that he can put one, two, three solid performances together, I believe we have found our new man going forward; all the while saving a huge chunk of salary cap cash. That is if you can move Huet with his current contract. ← Red Wings Trade Ville Leino for… Nothing?